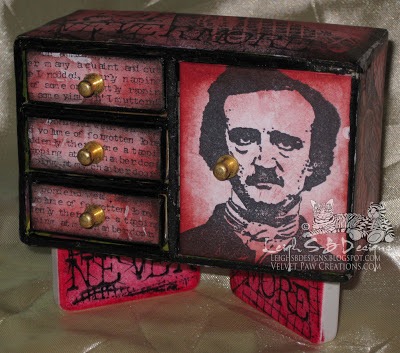 Velvet Paw Creations: "Nevermore" Altered Poe themed Box for Smudgy Antics! "Nevermore" Altered Poe themed Box for Smudgy Antics! Day 7 was one of my projects and I shared my Poe inspired altered box which stands on two altered dominoes. My "Nevermore" creation is also my Smeared Ink DT inspiration piece for week 2 of Smudgy Antics current Alter a Box challenge! Also don't forget that this month's DominoART challenge is also Half-O-Ween themed so come and play with us! June 4th is Skull Appreciation Day Blog Hop with Smeared Ink! DominoART is making a day of it by featuring skull altered game art by readers who would like to join in the fun! Click the link above for all the details and to sign up! So there's lots of fun things to see and do so get stamping! Now for my spooky altered box! Have you all been watching the tv series The Following with Kevin Bacon? All the Poe symbolism is just down right creepy isn't it so I hope my altered box doesn't give you too many chills....bbbwaahhhaaa! For more info and photos please see my post on DominoART! Did you not want any of the Glitter Gore Girls on dominoes??? Thank you Kristy! I'm going to dash off now to look at your latest project! Yes, I did want one of your glitter gore girls and I posted a few times over at the forum but I don't think my posts showed up :0( I was hoping to share them during 15 Days of Half-O-Ween too and have one spot still available and if I could share them on that day that would be awesome! I posted the same question on the forum too ;0) lots of hugs! This box is so striking! It just makes you want to open those drawers and see what goodies are inside. Love how you made the base with the dominos. Wonderful box.